Talking about snowflakes with children can lead into many other educational and fun discussions. You can talk about how snowflakes are formed, how they melt, and especially how each and every one is different. Just like children, snowflakes are tiny, unique, and extraordinary! So this winter, why not try making these snowflake window decorations? This snowflake craft for kids is not only fun and simple to do, but is inexpensive and create a beautiful finished product ready for hanging! Plus, it’s a great way to keep kids busy indoors during the winter! Sound interesting? Take a peek at how you can create your own snowflake window decorations! Glue three craft sticks together to make the snowflake shape, one on top of the other. If you wish you can decorate the sticks with paint or markers (optional). 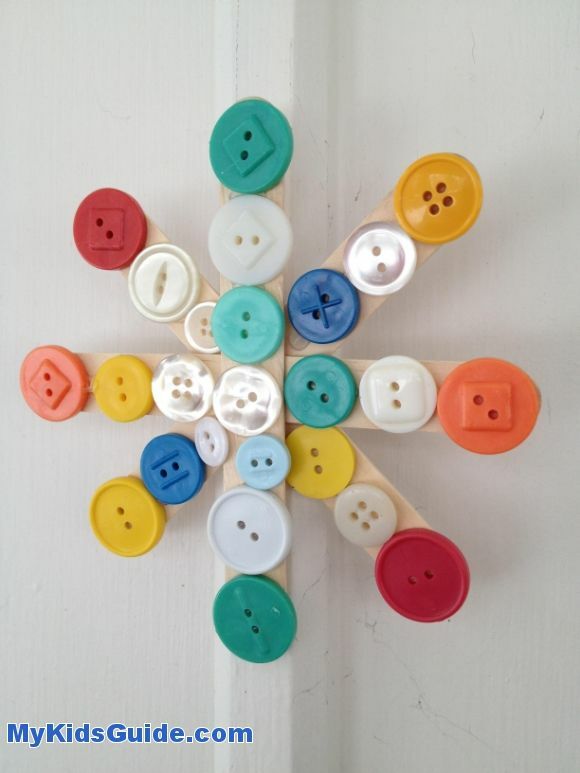 Arrange the buttons on the snowflake so you get an idea of where you want them to go. Once you have decided, glue them on the snowflake. Use as little or as many as you wish! Remember, each snowflake is unique! To finish, tie a piece of fishing line on the snowflake so you can hang them! These look lovely displayed in a window where they can catch light. This window snowflake crafts for kids is so easy to make, that children may want to make several. And because they are so inexpensive to whip up, that shouldn’t be a problem! This snowflake craft for kids is simple enough to do with a large group of children, or low-key enough to do at your kitchen table with just your own kiddos. Want to extend this window snowflake craft for kids activity further? Why not create a compare and contrast chart? You can list what the different snowflakes you made have in common, and what about them is different. For example do several of the snowflakes have blue buttons? Or does one have yellow buttons and one does not? Chart these differences and look for how they are alike and different. Once your snowflake window crafts are done, you can also dive into a great book and learn more about snowflakes! The Little Book of Snowflakes by Kenneth Libbrecht is a wonderful choice to extend this lesson and deepen your understanding about these little icy creations. 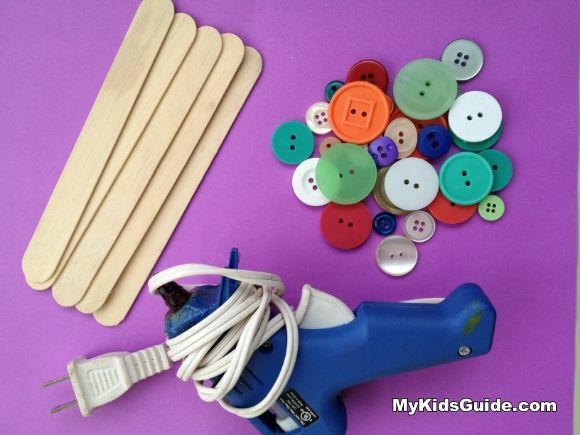 So pour some warm cocoa, gather the kiddos around the table, and start crafting! This kid friendly snowflake craft is sure to be a hit! That is so cute, and easy. Thanks for the craft. Randa @ The Bewitchin’ Kitchen recently posted..I Love Canadian Beef, Do You? This looks like the perfect craft for my toddler and I to do. We’d have to be careful she doesn’t touch the glue though. Thanks for the awesome idea! This is so cute! What a fun art project for the winter. Tammilee Tillison recently posted..Did you know Best Buy recycles electronics? I love this idea. I’m not craftr and even I can do it! Joyce@MommyTalkShow recently posted..Order a Free Nursing Pillow: Just Pay Shipping! This is sooo cute I am going to do this next Christmas and use them as Christmas decorations. Thank you for linking this u to pinteresting, what a fab idea so I shared with my Facebook followers too! Please link stuff up each week on Thursday at 8pm, you’ve got lots of good stuff!